The crown: cemented onto the abutment to replace the part of the tooth that we see. The implant is usually placed by an oral surgeon. Most patients tell us that the placement procedure is easier than having the tooth removed. We utilize an oral surgeon due to the multitude of types, sizes and designs of implants; the surgeon has the expertise to decide the correct model at the time of placement. Once the implant body is placed, it takes about 10-12 weeks to heal. 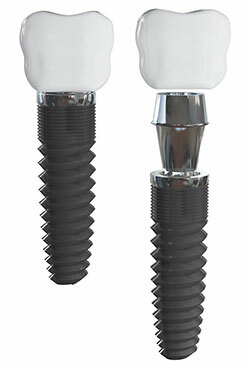 Once the implant is secure, we make an impression and fabricate the crown. This takes about 4 weeks. There is a lot of information about “immediate placement” and mini-implants available in popular media. We encourage you to talk to us about the proper procedure for you that provides the best long term outcome.